Today is April 24th, which is the Armenian Genocide day of commemoration. All around the world Armenians hold events to raise awareness and remember their ancestors. In the age of social media, April 24th has also moved online. For the last few years, Twitter hashtags of #armeniangenocide and #recognizethearmeniangenocide and #recognizearmeniangenocide have been common. This year I’ve also seen a growth in image memes or inspirational images posted to Facebook (not surprising, as that trend has been occurring on Facebook more widely. In the past few months, we’ve seen a number of hashtag hijacks. Here’s my report on a hijacking of #armvote13, #protestbaku, and an attack on an individual. In all of these cases, a group of individuals “take over” a hashtag by posting messages unrelated to the “spirit” of the hashtag. For example, #armvote13 was about reports of election violations, election results, etc, and people were using it to write things against Armenia and Armenians. The result is that the hashtag becomes useless because the useful information is hard to find. So, back to April 24. 1. Unlike #protestbaku or #armvote13 – hashtags that were first being used by a small(ish) network of people to share information and second to get information out, #armeniangenocide is entirely an awareness-building hashtag with no information sharing or coordination purpose. 2. To use #protestbaku or #armvote13 you actually had to KNOW that the hashtag existed – someone had to tell you, or people you know on Twitter were using it. (And in both cases, the hashtag was decided upon by small groups of well known users and announced before the event.) #armeniangenocide is a no-brainer! This is the term that people use – it isn’t something that someone had to invent. So any person, veteran Twitter user or not, can get on Twitter, write a message “Hey, don’t forget the #armeniangenocide” and never use the hashtag again. 3. Similarly, it isn’t useful to follow the hashtag #armeniangenocide — it isn’t like #armvote13 where someone may be sitting at home waiting to hear news, or a hashtag like #ica13 (that I use for an academic conference) where people want information on hotel deals or something. There is no purpose in following #armeniangenocide as a hashtag. This morning when Kim tweeted about the Armenian Genocide, she had over 1000 retweets every minute. Given all of this, trying to hijack the #armeniangenocide hashtag is a waste of time. 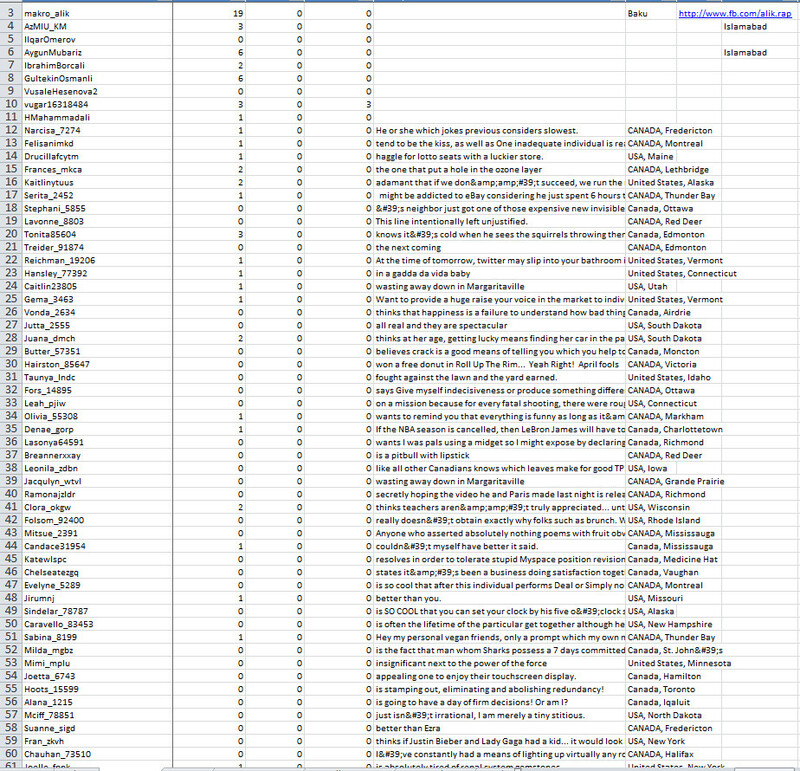 I did a few nodexl hashtag analyses today, but the hashtag was so busy, there was no way to really track it. There is one other reason that the efforts to hijack the #armeniangenocide hashtag were futile. 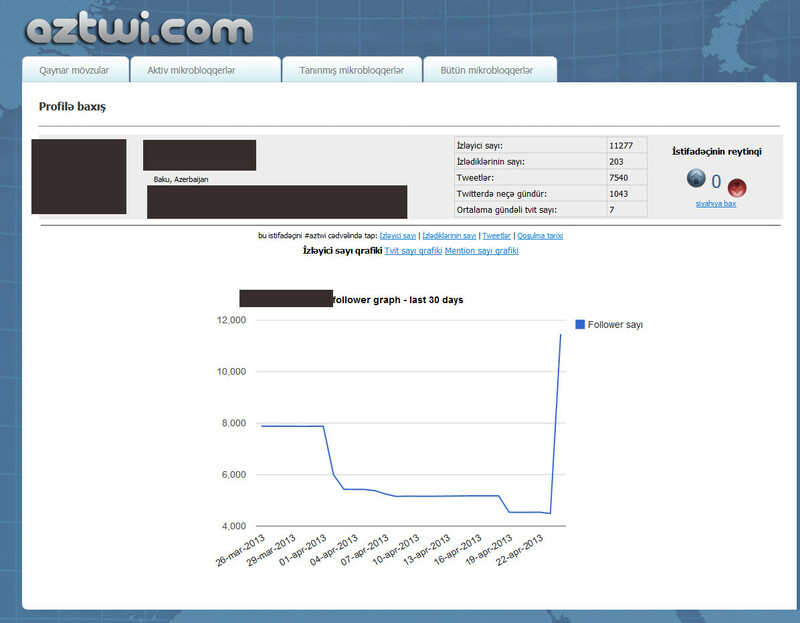 Moreover, one can see using particular tools when there is an unusual growth in followers. For example, the below image. If one were to try to acquire a bunch of Twitter followers in order to look more important or powerful or influential, one should try to be less obvious about it. Normally Twitter users have written at least one tweet and follow some people. Furthermore, no native English speaker would write their location as CANADA, Regina or USA, Connecticut. Mine is Seattle, WA. At a quick glance of my friends, almost every American and Canadian writes their location in the way that we do on letters: Ann Arbor (city), MI (state abbreviation). 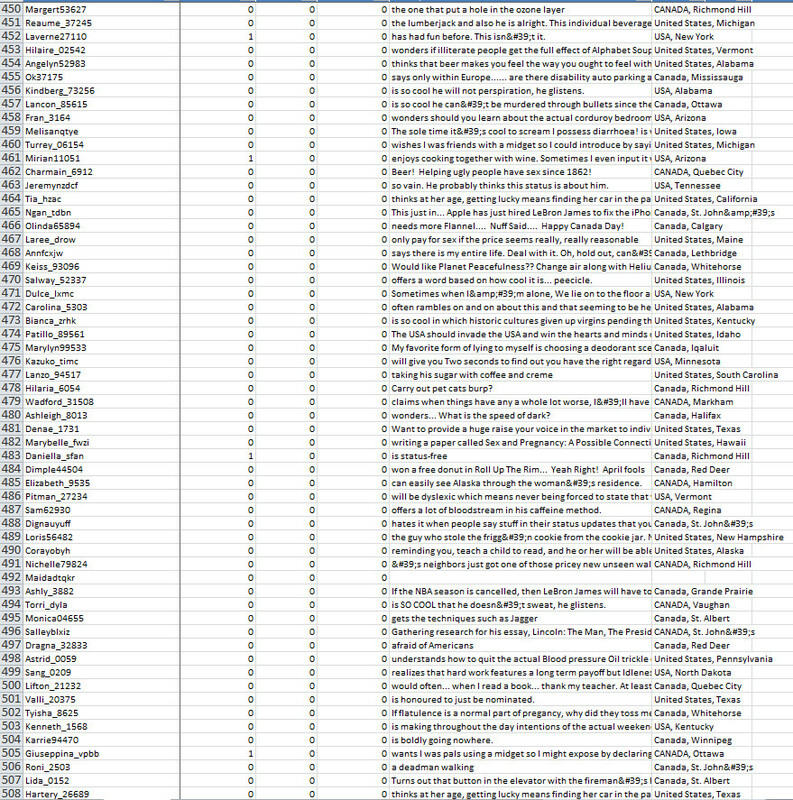 If you’d like to look at the Excel file of this particular Twitter user, contact me @katypearce on Twitter and I’ll send it to you. 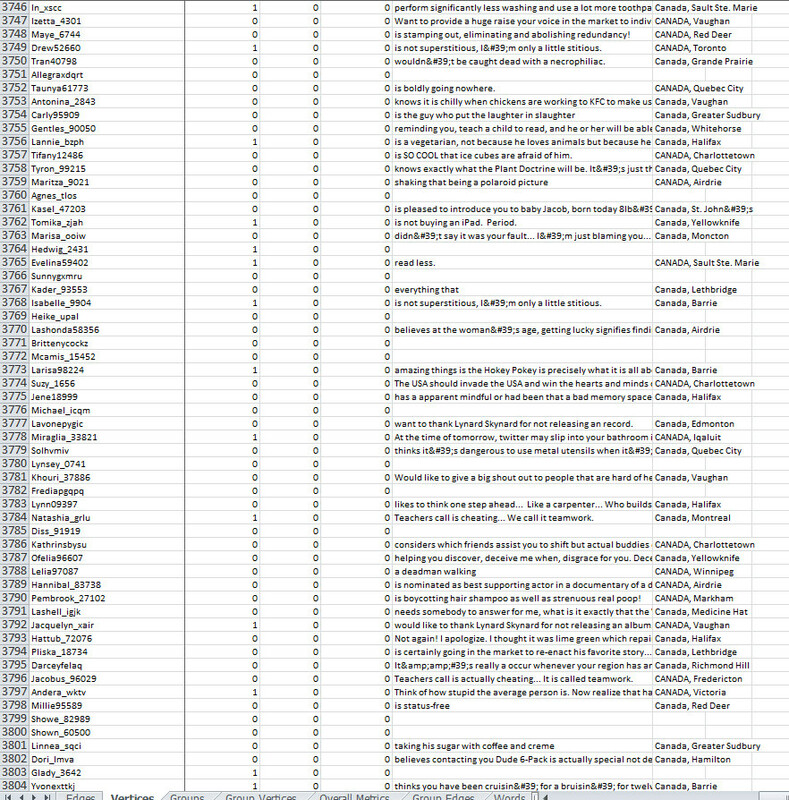 Even though this is all publicly available data, in honor of privacy, I won’t post it here. In Azerbaijan, an authoritarian state with little space for free expression, much of political life takes place on the Internet. While the opposition uses the Internet and social media for organization and information sharing, the Azerbaijani government also uses social media to advances it positions as well as to deter dissent. While this online battle is not unique to Azerbaijan, what is unique is that the Azerbaijani government does not engage in very much Internet filtering and even claims that Internet freedom exists in Azerbaijan. Thus, government control of the Internet in Azerbaijan is not technical, but psychological. In recent months, Azerbaijani online political life has taken on increased importance. This talk will also outline recent events and speculate on how social media will impact the 2013 presidential election. It shall be livestreamed here. Here’s a hashtag analysis for the last week (this includes following relationships). 3 main groups here – foreigners, diaspora, and Hayastantsi. 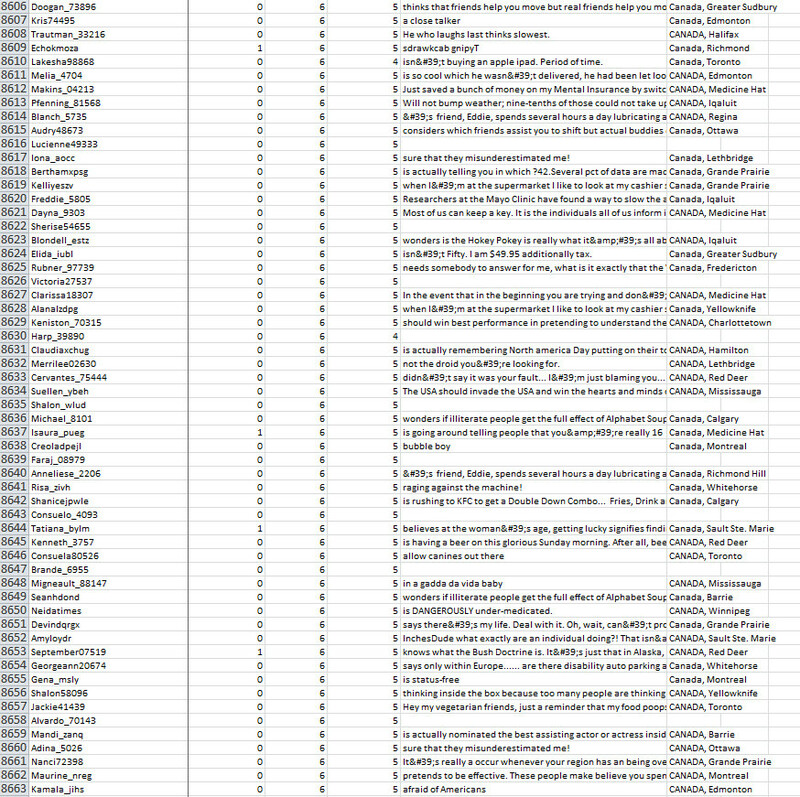 Here’s the analysis for just replies and mentions. The groups here are more interesting. There is a group of people all talking to/with @onewmphoto, another with @goldentent and @unzippedblog, another with @mkdotam, and another with @writepudding.